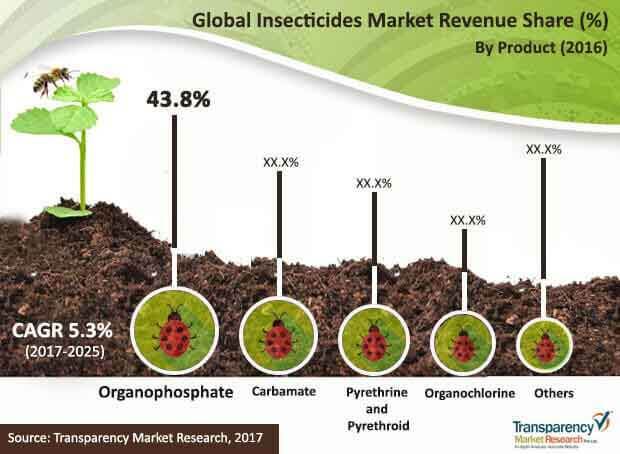 The dominance of well-established and larger players has rendered the competitive landscape of the global insecticide market significantly consolidated. Therefore, the focus is on expanding their regional footprint besides retaining their existing market share. To achieve this, the market players are strategizing the launch of novel products. Besides this, several of them have taken up on strategic collaborations, which some have entered into mergers and acquisitions to explore newer and more lucrative markets, finds Transparency Market Research (TMR) in a new study. “Over the next few years, the companies operating in the global insecticide market are likely to focus on sustainable practices and integrated pest management techniques in order to improve crop yield without adversely affecting the environment,” said a lead TMR analyst. According to TMR, the global insecticide market is forecast to US$23 mn by the end of 2025, from US$14.6 mn, which was its value in 2016. During this period, the market is expected to exhibit a CAGR of 5.3%. In terms of value, the global insecticide market was led by organophosphates in the product category in 2016. Regionally, Asia Pacific showcased the most lucrative prospects in terms of volume, trailed by Latin America in the same year. The presence of large arable land supported the market’s expansion in Asia Pacific. Besides this, the insecticide markets in North America and the Middle East and Africa are expected to expand considerable during the forecast period. Innovative strategies adopted by the market players to emerge at the fore, besides government initiatives over the past few years aimed at supporting agricultural growth have tilted scales in favor of the global insecticide market. Positive outcome of government campaigns conducted across the US, Nigeria, and India has encouraged several other countries to follow the drill and spread awareness regarding vector diseases affecting agriculture. Various NGOs have come forward to support the cause. For instance, the WHO has various programs implemented to propagate healthy agricultural practices across the world. Such efforts will have a strong influence on the overall insecticide market. As the demand for insecticide rises further, the competition prevailing in the global market will get steeper. To counter this, several companies are likely to focus on diverse marketing channels such as the internet, radio, newspapers, and billboards. In addition, the market players are also looking to spread awareness regarding various vector diseases. Also, several companies are regionalizing their marketing efforts in a bid to gain increased traction in the coming years. Such expansion strategies adopted by the market players have the ability of affecting the insecticide market positively in the coming years. Other factors that will contribute significantly toward the market’s expansion in the coming years include escalating concerns of diseases transferable by insects, commercial availability of pest management services, and focus on preventing diseases rather than cure will aid the market’s expansion in the coming years. The market will also benefit from research and development in the field of bio-insecticides market. On the downside, the toxic properties present in insecticides are considered hazardous for domestic pets and young children. While this could be a key challenge for the market, secure operating methods and proper handling can help keeping the hindrance at bay.